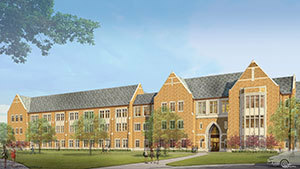 McCourtney Hall, to be located on the east side of the Notre Dame campus near Hesburgh Library, will be a 220,000-square-foot building underwritten by a $35 million gift from the McCourtneys. McCourtney Hall is the first dedicated research building to be constructed in a planned larger East Campus Research Complex. The research quad will create, for the first time at Notre Dame, a space for highly collaborative, state-of-the-art research that crosses the Colleges of Science and Engineering. The building will support research space needs that are currently unmet on campus and facilitate current Strategic Research Initiatives and the Advancing Our Vision hiring plans within the molecular sciences. The departments that have been selected to move into McCourtney Hall – chemical and biomolecular engineering in the College of Engineering and chemistry and biochemistry from the College of Science – were chosen based on a comprehensive assessment from the Research Space Committee, whose members included representatives from the deans’ offices, the Office of the Vice President for Research and the Provost’s Office. The three-story McCourtney Hall will have some 100,000 square feet of open laboratory and team spaces. It will include two wings and a central collaborative core for faculty offices and conference rooms. About 40,000 square feet of laboratory and team space will be left unassigned to facilitate new hires. Construction will be complete in June 2016. McCourtney is a general partner of Saw Mill Partners, a private investment partnership in Katonah, New York. He previously served as managing general partner of Venrock Associates, a venture capital firm that manages investments for the Rockefeller family and other limited partners. An emeritus member of the University’s Board of Trustees, McCourtney earned a bachelor’s degree in mechanical engineering from Notre Dame and a master of business administration degree from Harvard University. Notre Dame bestowed an honorary degree on him in 2010. He served as a lieutenant in the U.S. Navy and worked with McKinsey and Co. before joining Venrock in 1970. McCourtney is a past president of the National Venture Capital Association and previously served on Notre Dame’s advisory council for the College of Engineering. Tracy McCourtney earned a bachelor’s degree in English from Pennsylvania State University and, following graduation, served as a social worker assisting foster children in New York City. 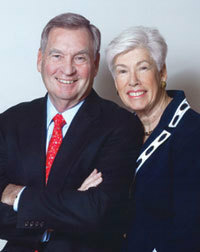 The McCourtneys previously supported the construction of Stinson-Remick Hall of Engineering with an $8 million gift. Other gifts include an endowed professorship in computer science and engineering, plus contributions to the Rev. Edmund P. Joyce, C.S.C., Grants-in-Aid and The Malpass Scholars Program. The groundbreaking ceremony also will recognize a $10 million gift to the research facility from alumnus Thomas J. Crotty Jr. and his wife, Shari. Crotty is a senior adviser at Battery Ventures in Boston after previously serving as managing general partner for the firm. He has served on the board of the National Venture Capital Association and chairs the board of directors for Grassroots Soccer, a nonprofit that seeks to eradicate HIV/AIDS in Africa. Also a Notre Dame Trustee, Crotty previously served as a member of the Mendoza College of Business Advisory Council and the advisory board of the University’s Gigot Center for Entrepreneurship at Notre Dame. He currently sits on the board of The Foundation for MetroWest and is a trustee of the St. Mark’s School in Southborough, Massachusetts. Shari Crotty is a member of Notre Dame’s advisory council for the performing arts. A graduate of the University of Southern California, she is affiliated with the Cure Alzheimer’s Fund and Friends of Fay School. Tom Crotty was a member of the Notre Dame soccer team, and he and Shari directed a $3.9 million gift to the construction of Alumni Stadium, the venue for the Irish men’s and women’s soccer teams. Originally published by Dennis Brown at news.nd.edu on October 03, 2014.